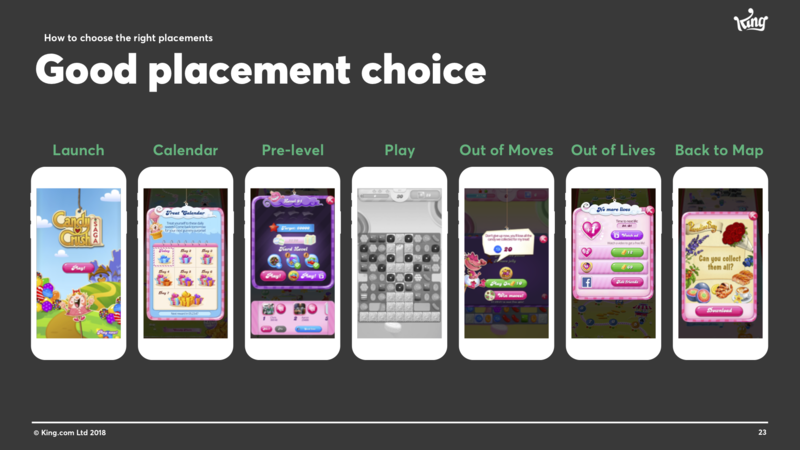 “If you create a great advertising experience for players, they’re going to want to engage with it,” says Melissa Stein, global vice president of ad product at King, makers of hit mobile game Candy Crush Saga. Though it’s a supplement to their multi billion dollar IAP revenue stream, King today monetizes some of its titles with rewarded video advertising. In a recent webinar with the Mobile Marketing Association, Stein shared the inner workings behind how King thinks about integrating rewarded video ads and the fundamentals of creating a great ad experience. From this presentation, we selected five attributes that should be a fixture of every rewarded video integration. In exchange for watching a rewarded video ad, the rewards offered need to actually help players advance and give them more time within the game. When players receive a reward, they are stronger, better, richer, faster, or have more resources to survive. 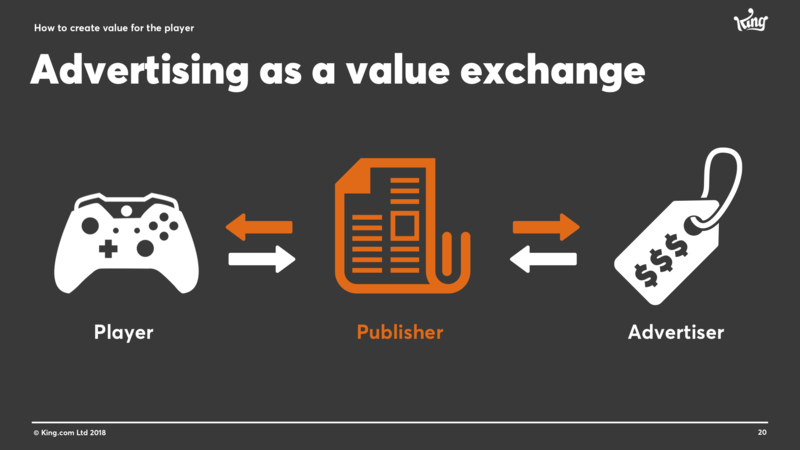 Being the advertiser that leads the player to the rewards creates a positive brand association and the advertiser has more opportunity to continue to share more ads (and rewards) during gameplay. When a player is out of moves, lives, energy, etc., this is when brands can swoop in with a rewarded video and be the hero. Until then, keep gameplay sacred and do not interfere with the flow of the game. Instead, be there with the extra boost they need to continue playing the game. Don’t force anyone to watch your ads. It’s a sentiment shared by many other leading mobile game developers, including Top Eleven maker Nordeus. The logic behind rewarded video is that players want to see the ad because it helps their gaming experience. If a player does not want to see your ad, then there needs to be an option for them to get out easily and continue playing. Expirementers. These are players looking for something new beyond the core loop experience (i.e., the base action or series of actions repeated throughout a game). They are highly engaged, making this a great opportunity for the advertiser to sponsor an experience outside the core loop (e.g., contests, treasure chests, quests). Passive engagers. Busy people, who play during a break in the day. For this audience, you want to get ads to them early to maximize your advertising opportunities. Routine consumers. Habitual in their play. For example, a half an hour a day, everyday, before going to bed. By knowing their playing habits, advertisers should max out their frequency cap during the course of play, as opposed to a 24-hour period. Ad lovers. Players who strategically wait to engage with ads, knowing there’s a maximum allowable amount of ads they can watch in a day. Once they’re stuck at a certain point in the game they will tap into their reserves to view the ad and take advantage of that reward. What King’s best practices reinforce is that the approach to developing rewarded video ads should be audience (player) centered. 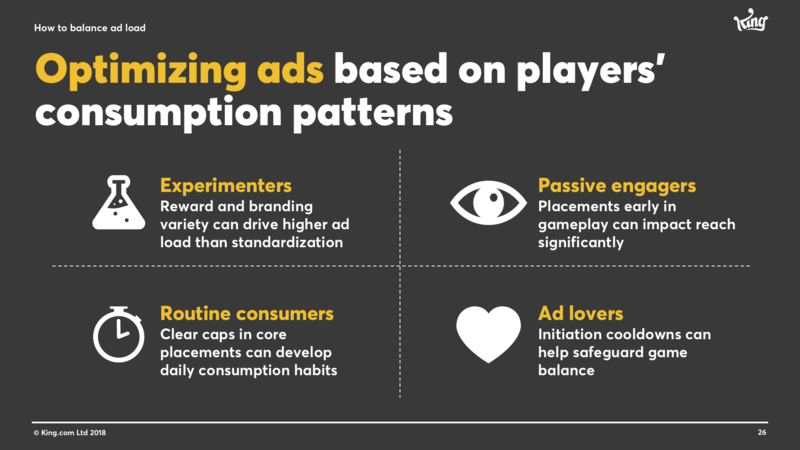 Players acknowledge those advertisers which have taken into consideration how an ad and its placement will impact them by choosing to give their time and attention to that particular brand. In exchange, brands themselves will be rewarded with greater brand recall, message association, and purchase intent.